Meet my new friend Larry Peters from O’Neill, Nebraska. That ’54 Chevy was his very first car and he still drives it! We were walking down the block from our hotel (which rates a post all its own) when I saw the car across the street from a bar with a bunch of Harleys parked in front. Naturally I had to take a picture. While I was doing so, Larry and his wife came out and caught me, so we introduced ourselves. Man oh man. 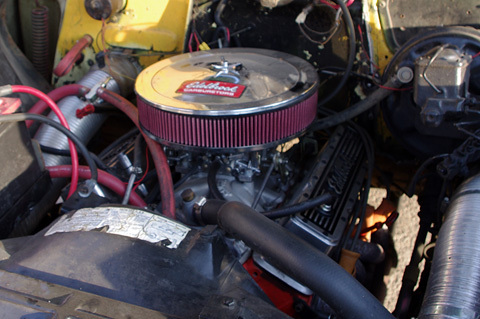 For anyone who doesn’t know, that’s a small-block Chevy V-8 with a four-barrel carburetor and headers at the very least. And no, ’54 Chevys didn’t come with those. [Ahem.] I knew exactly what I was looking at. Larry is a 65-year-old guy with a nose like W.C. Fields’ and a Harley-Davidson T-shirt but he might as well be some kind of angel sent to flesh me out. That motor is exactly what I always dreamed of in my early teenage hell years back in Abilene. Not so hopped up you can’t drive it on the street, but plenty hot enough to make that rust heap twist and scoot. I used to buy Hot Rod magazine and read it cover to cover every time. I didn’t know what all the articles were about but studied them regardless, hoping I’d eventually grasp the mechanics. Believe it or not, that actually worked, although I never had the wherewithal or gumption to get down and greasy. Larry still does, tucked away in darkest north Nebraska. What’s more, he and his wife belong to some kind of club that drives 600 miles every summer, going through all the little towns and never leaving the state. In a beater hot-rod ’54. With dual exhausts and a fine, fine rumble. Larry, do you have any idea how glad this stranger is he met you? I hope he sees this. I gave him my card.